The Hulme Locks Branch of the Bridgewater Canal was opened in 1838 to provide a link from the main line of the Bridgwater Canal to the River Irwell, then the Mersey and Irwell Navigation. The branch closed in 1995 when the new Pomona Lock opened a little further along the canal. There are two lock chambers still in existence, although the upper chamber, seen in the photo above, has no working gates so the intermediate pound is at the higher level and the lower lock is the full height. The upper lock was certainly working in the 1930s, but with a much shallower drop than the lower lock. The sides of the intermediate basin have been built up since then, and the lower lock made full height. Perhaps someone will leave a comment to explain when and why this was done. The bottom lock of the Hulme Locks branch sits under the arch of the railway viaduct and leads onto the River Irwell. You can see a virtual cruise along the Hulme Locks Branch with a choice of starting points. This entry was posted in Hulme Locks Branch, Hulme Locks Branch (Brdgwtr Cnl) by Paul. Bookmark the permalink. 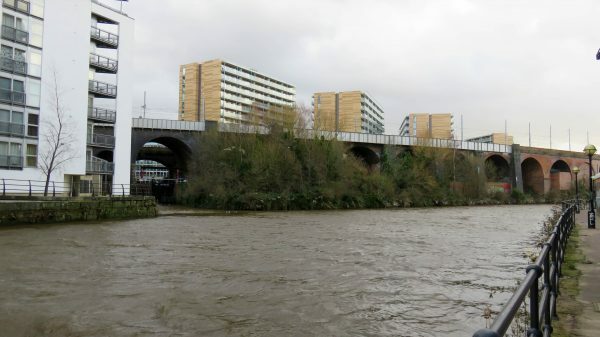 There were originally three locks on the Hulme Locks Branch but because of the large amount of barge traffic carrying maize from ships in Salford Docks to Kelloggs factory in Trafford Park, improvements were made to the Bridgewater Canal in the 1950s and 60s which included changing the three locks to one single deep lock. This happened in 1962. 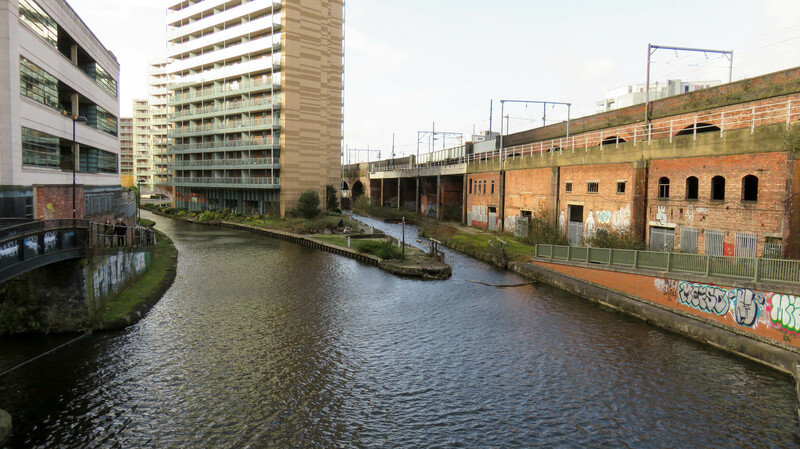 The canal was also deepened between here and the Kelloggs factory so that the barges could carry greater payloads. A new fleet of steel barges was build in the late 1940s and early 50s, principally to carry the Kelloggs traffic. This traffic ceased in 1974, because Kelloggs were finding it increasingly difficult to find suitable ships to bring the maize from Canada that were small enough to use the Ship Canal so they built a new mill at Liverpool.